Wash and cut Okra (Bhindi) in 4-5 pieces each. Don't wash it after cutting, it will make the preparation very gooey. then add haldi powder, dhania powder. Hi Fozia, i tried this recepie two days and found it to be very tasty. i really discovered okra with new taste and flavour.Keep posting some easy and delicious recepies. thank you for this one. I suggest using methi instead of jeera, also instead of tomatoes which would make the vegetable gooey, use some amchoor. It makes a lot of difference, try it. Great recipe . Thank U .
after washing behndi dry it on newepaper or wipe it with cloth it will turn out more cripsy. bhindi is most preferable dry. its gives a better taste in a semi dry form. if u add lemon or tomato chutnet to it and cook covered it will get gooey. chopped tomatoes should be added just before the final touch on a very high flame to avoid getting it gooey. U can also add tamarind paste or kacchi keri (or green raw mango) pulp to the vegetable. Thats how my sis-in-law cooks it & it gives a great taste to the lady finger. 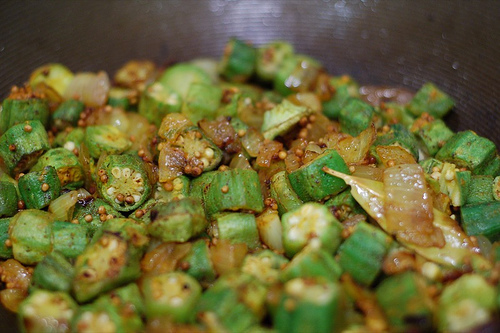 add methi(khadi) and jeera with onions in the begining to give the best taste to your bhindi. never cover the vessel in which you are cooking Bhindi.It give gooey effect. Second put haldi after onion get golden brown or red chilli powder ,it will give good colour to your bhindi.